BOSTON?/span> THE COMPLETE SOURCE FOR OPEN GEARS . . . Pitch Diameter .333" to 6.000"
14-1/2?Pressure Angle Boston helical gears are stocked both right and left hand, made with a 45? helix angle. They are designed to transmit motion and power between nonintersecting shafts which are positioned either parallel (opposing hand) or at 90?to each other (same hand). Because these gears are top-hobbed, there is extremely close concentricity between the pitch diameter and the outside diameter. -CHelical Gears tend to have greater load carrying capacity than Spur Gear of similar size. All Boston Helicals are cut to the Transverse Diametral Pitch System, resulting in a higher Normal Diametral Pitch Number. 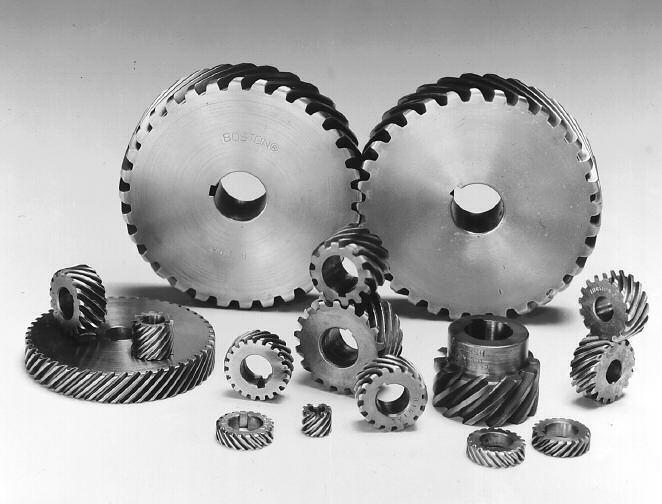 For parallel shaft applications, helical gears provide overlapping tooth contact. This results in a smoother, quieter operation and higher horsepower capacity than afforded by spur gears of comparable size. Boston helical gears are top hobbed, resulting in extremely close concentricity between the pitch diameter and the outside diameter. Approximate horsepower and torque ratings for selected sizes (numbers of teeth) at various operating speeds (RPM) are given for hardened steel helical gears. The ratings are based on the beam strength of the gear tooth. These ratings are for parallel shaft applications under normal operating conditions, that is: properly mounted and lubricated, carrying a smooth load for not more than 10 hours per day or a moderate shock load not more than 15 minutes in two hours (Service Factor 1.0). Refer to Table 1, below, for other types of service. Ratings for gear sizes or speeds not listed may be interpolated from the values indicated. Pitchline velocities are limited as reflected by the lack of ratings for larger numbers of teeth at higher RPM/s in the selection chart. Application in this area is not recommended. Horsepower ratings for bronze gears are approximately 33% of these ratings. 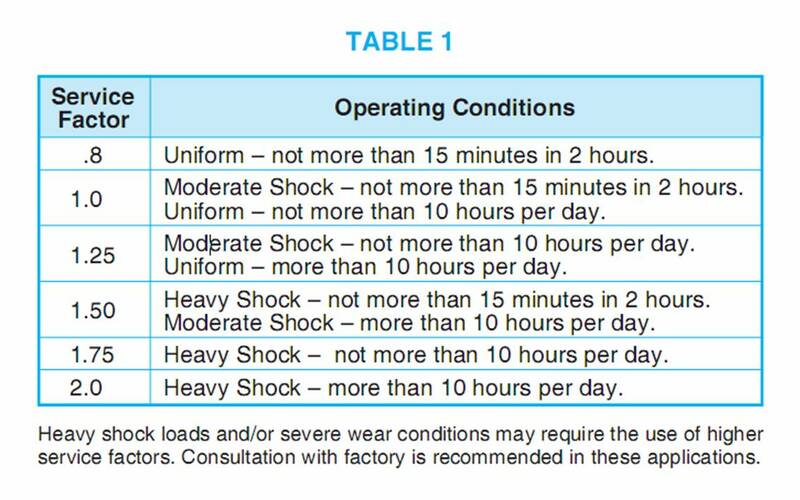 b.With knowledge of operating conditions and load classi- fication, select service factor from Table 1. 3.Select pinion with horsepower capacity equal to (or greater than) design horsepower determined in Step 2. Reference Rating Pages 55, 56. 4. Select a driven gear with a catalog rating equal to (or greater than) the horsepower determined in Step 2.